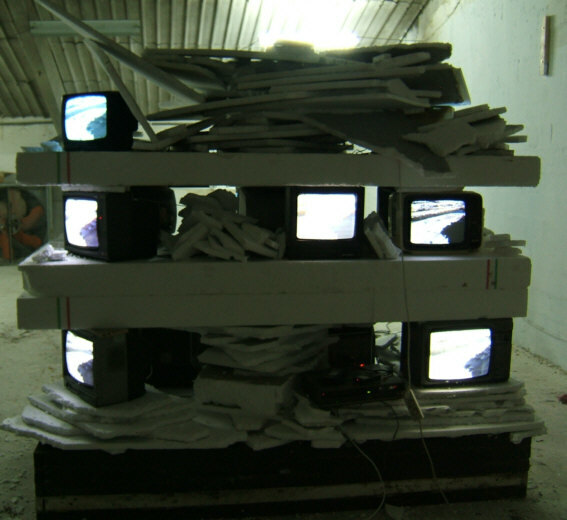 Video Installation using scrap electronic appliances and building materials. A piece exploring the theme of reactions to powerlessness. A comment upon the unilateral process of communication in place in the existing media power structure (producer=active, – consumer=passive) with which we are targeted, and which reflects ruling ideology and in fact fabricates non-communication, since communication by its very nature should be reciprocal. Power belongs to he who gives but to whom no return can be made (1) . A TV channel broadcasts three idiosyncratic, looped films made by the artist of the changing panorama from his front window, a visual record of the moulding of the urban landscape by forces with questionable democratic credentials and the unintentional side effects generated by this process in the form of ‘subject-object moments’ featuring a few individuals either showing submission, dogged determination or futile resistance as they live amidst the shifting construction work. 1. Baudrillard, J: The masses: the implosion of the social. Un canal de TV emite tres cortos grabados por el artista desde el balcón de su casa, mostrando el pánorama cambiando de unas obras de gran envergadura , un proceso dirigido por grandes intereses económicos y tramas de influencia de dudosa legitimidad, dónde la cuidadania no tenía cabida alguna (info). Se generan unos ‘efectos secundarios’ capturados en los videos; ‘momentos sujeto-objeto’ protagonizados por unos individuos mostrando diversas reacciones – sumisión, determinación, o una resistencia inútil – ante los desafíos de una vida afectado por el proyecto de obras. I am writing to take issue with the article ‘ Take me to the river’ by Elizabeth Ellis which appeared in your August InMadrid. (…) The project has from the outset been characterized by a lack of transparency and public consultation. Local residents were neither informed nor involved. (…) 80 hectares of green areas were destroyed, (including the historic Arganzuela park) and gallons of concrete took their place. (…) There has been extensive criticism from environmental and professional groups of all aspects of the project. In fact, the lack of any kind of prior environmental study led to a a Brussels investigation and its being declared illegal in October 2008. The project will not lead to a greener city; 250,000 more cars per year now pass through the M30 tunnels, leading to additional pollution – one study presented by Ecologistas en Acción showed this to be ten times more than the safe level. In 2006 residents even staged an invasion of a tunnel in protest; numerous other protests by local groups took place but went largely unreported. The companies responsible for the actual building work were appointed in highly dubious circumstances. The second most expensive bid was chosen, that of ACS-Dragados Ferrovial, coincidentally companies headed mostly by one Florentino Perez. The initial budget of 3.900 million euros has since skyrocketed. Including debt repayments, the work will cost all madrileños 222 million euros per year – until 2040! Most of this will go to the pockets of Banco Sabadell, and Dragados-Ferrovial, who are predicted to get 14 million euros profit annually until then. This has already had a negative impact on residents, who have seen local taxes increase by over 40% in two years and will doubtless affect future quality of life, as the city is the most indebted in Spain. I believe journalists have a responsibility to challenge official accounts and question the validity of decisions. This has not been the case here. As a resident in the thick of it all, I am disturbed by the way media, including InMadrid in this instance, have uncritically reported this out-of-control, expensive, corrupt and undemocractic project and neglected even a passing mention of very real negative effects on local people and environment, which will be felt by all of us over the next few decades.